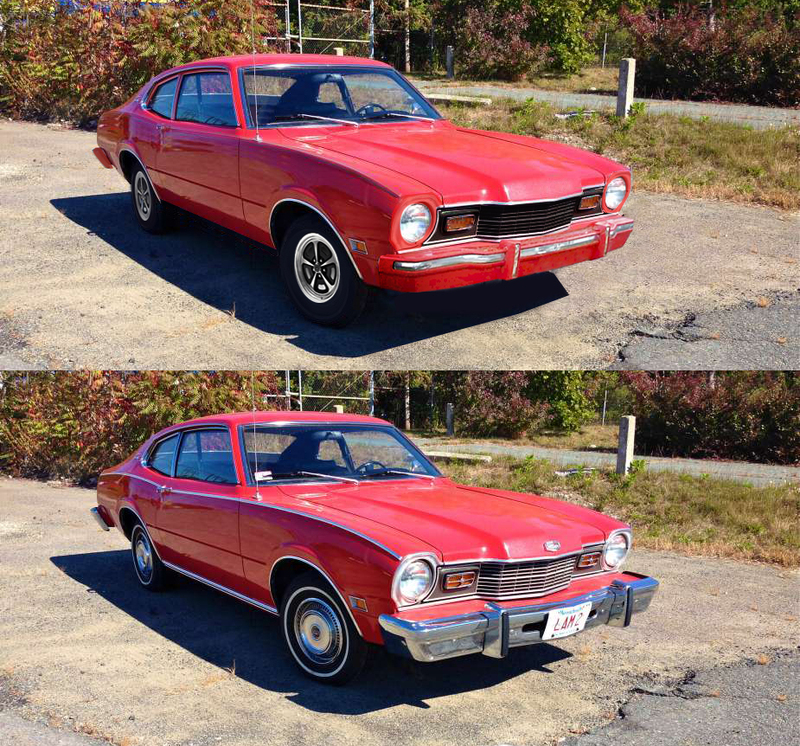 Curbside Classic: 1974 Mercury Comet – Can You See Those Bumpers From Space Yet? 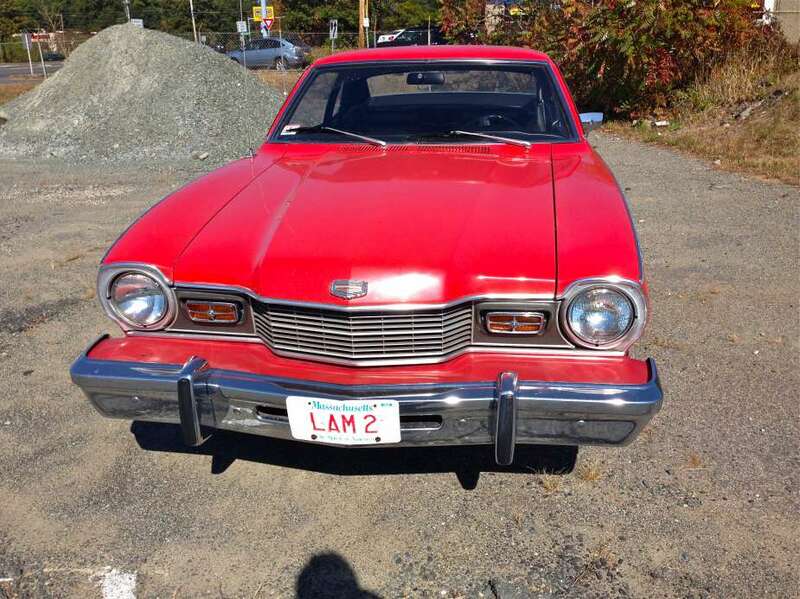 This isn’t the first time we’ve featured a fifth-generation Mercury Comet at Curbside Classic. Some time ago, Paul wrote about a 1972 two-door Comet GT, and this past summer, JPCavanaugh wrote about a 1971 four-door Comet he spotted. 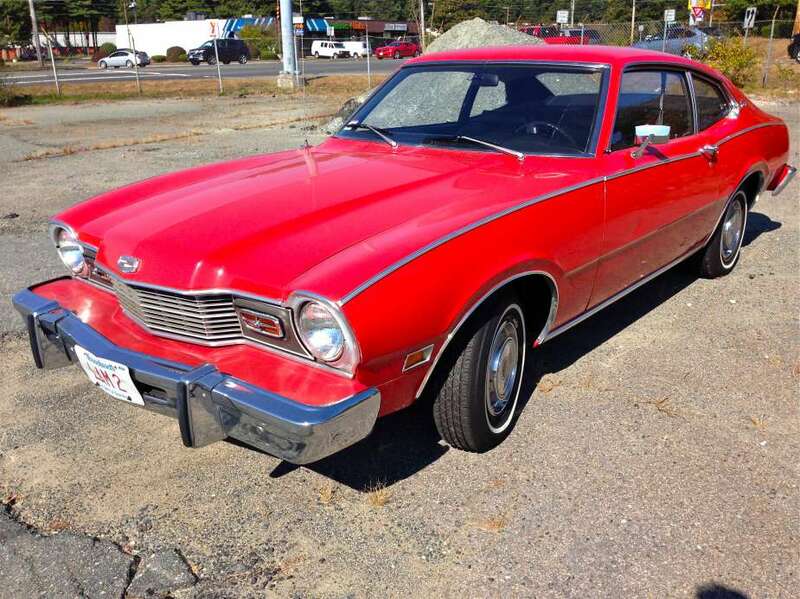 Disregarding the trim levels and number of doors, there’s something visually different about this red 1974 Mercury Comet that I found a few months back. I just can’t put my finger on… oh wait! It’s that enormous battering ram bumper tacked on the front! Let’s be honest though, when introduced, the 1971 Mercury Comet wasn’t exactly the Farrah Fawcett of cars. Still, things can always go from bad to worse, which is exactly what happened in 1973 and subsequently, 1974. If you thought the NHTSA-mandated five mile-per-hour impact bumpers looked awful on the ’73 Comet, then the even bigger ones on the ’74s were purely comical. Maybe they were NASA-mandated, in order to be seen from outer space. Some cars were able to integrate these new bumpers fairly well, with minimal disruption to the overall design. Others, like our featured car, were not so fortunate. The Comet’s front and rear bumpers were so gigantic, they required cow catcher body-colored extensions before the actual bumper was tacked on. This was especially noticeable at the front, due to the grille’s forward slant. 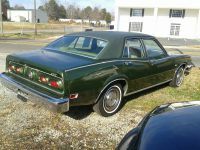 Besides adding about four more inches in length (to 1973’s additional four inches over 1972), 1974’s bumpers added over 200 pounds to the Comet’s curb weight, bringing a base two-door model of this “compact” to just a few shy of 3,000 lbs. Needless to say, fuel economy suffered. To make matters worse, the introduction of the ’74 models coincided with the 1973 Arab Oil Embargo. Yet weight increases affected new automobiles across the entire landscape. So as consumers flocked to smaller cars, sales of Mercury’s smallest offering actually went up, especially for the four-door sedan. In fact, 1974 was this generation Comet’s most successful year, with over 120,000 finding buyers. The two-door coupe was definitely the better looking of the two body styles. Whatever the intent was for the sedan’s styling, it didn’t translate well in reality. 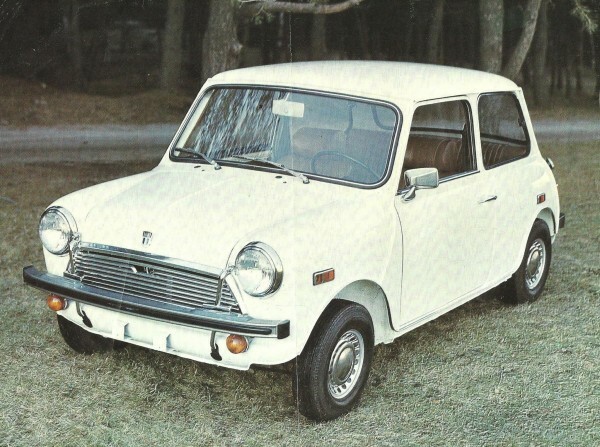 The coupe on the other hand, at least in its original incarnation, looked fairly decent for an early ’70s compact. With more and more people buying compacts primarily for their fuel economy, Mercury increasingly made luxurious options available to lure buyers who were used to large-car comforts. This one, however, is a pretty basic model. It features a split-back, cloth-and-vinyl bench seat which was part of the optional Deluxe interior. Plusher, leather-like vinyl buckets were also available, as part of the Custom interior. Despite its exterior design, the rear seat environment looks airy enough to me, with decently sized vent windows. The plastic over the wheel well is an interesting location for the lap belts. I apologize for any glare in the interior photos; I thought my lens was flat against the window when I took these. I have no idea what’s under the hood. Three engines were available, a 200 cu in inline-6, a 250 I6, and a 302 V8. Transmission choices were either a 3-speed manual or 3-speed automatic, like the one featured in this car. The Comet soldiered on, with sales steadily declining, through 1977 when it was replaced by the more conventional looking Zephyr. By that point it was bookended by the smaller Bobcat and larger Monarch compacts. 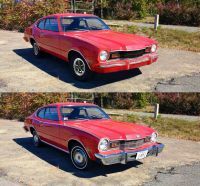 While it’s debatable which car’s appearance was most hurt by the federally mandated impact absorbing bumpers, it’s certain that the 1974 Mercury Comet received one of the most visible design modifications to accommodate them. Agreed: those bumpers were awful. Nobody did those big bumpers in a more hamfisted way than Ford. Thinking about it, these bumpers seemed to sap every bit of energy and vitality out of everything Ford designed from about 1974-78. If malaise had an automotive home in those years, it was the Ford Motor Company. Ford’s bumpers were pretty bad during that time, although some Chryslers and AMCs were not far behind. If you want to see some really, really bad ones, check out some of the low-volume imports of the same era. Makes me wonder if they weren’t hoping for the same customer discontent regarding 5mph bumpers. They definitely had to be regarding the seatbelt-ignition interlock. And it worked! Sure seems that way. The only reg I remember being withdrawn due to consumer compaint was the seatbelt interlock introduced in 74. The system had sequence logic to defeat people just buckling the belt and shoving it behind the seat. The sequencer had to detect 1-sit in seat, 2-buckle belt, 3-ok to start engine. By spring 74 the reg was repealed, dealers were provided with instructions how to defeat the system, and Motor Trend published DIY instructions for the big three’s systems. And that was the fastest I ever saw Congress respond to public outcry. A lot of people must have called up and promised to vote for the other guy in that fall’s Representative elections. 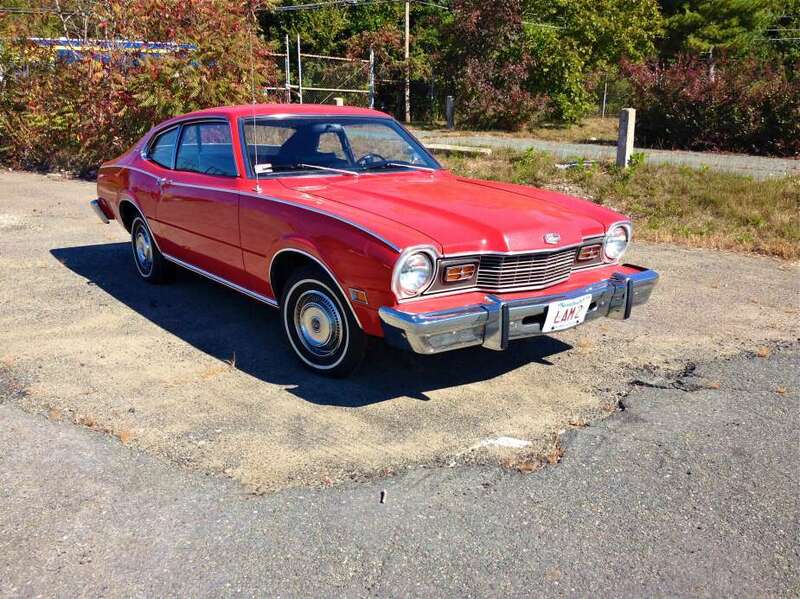 I never found Ford kept the Maverick/Comet looking fresh. In spite of the LDO edition, the Sprint or the Grabber packages, I never found these trims improved the looks that much. The later black/silver or black/red Stallion package wasn’t too bad. I used Photoshop here, but I see no reason why they couldn’t have considered a Mustang II type body-colored urethane covered bumper. Development costs could have been saved, as the Mustang II was coming on board in ’74 anyways. The chrome version bumper seemed so dated. And drew even more attention to their size. Also, maybe a matte finish grille with body color headlight bezels. I also think those four sectioned parking lights looked very 1960s. A full orange parking lens looks cleaner I find. It at least cleans up the front clip, and may have helped sell a few thousand more Comets. These bumpers aren’t as bad as the “piece of highway guardrail” ones used on the Checker Marathon. I was wondering what that glow on the horizon was this morning, must have been the sun reflecting off that massive chromed battering ram! Yes, that front bumper is a structure to behold, all right, but a very nicely-restored car, to be sure. 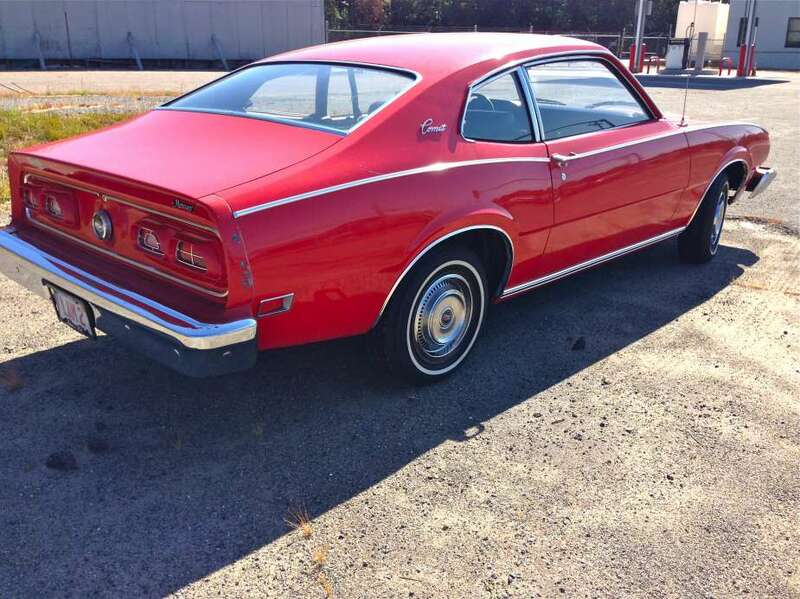 Other than that, these cars in coupe style are rather attractive, and not too bad in sedan form, but I never quite warmed up to them back then because I’m primarily a Chevy guy, but I did admire the simplicity of the Maverick/Comet twins just the same. 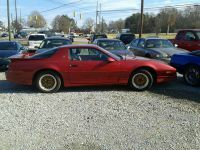 My first car was similar, only it was a Maverick of the same year. I don’t recall the Maverick’s front end being quite so ungainly, probably because the Comet’s grille protruded slightly in the center. 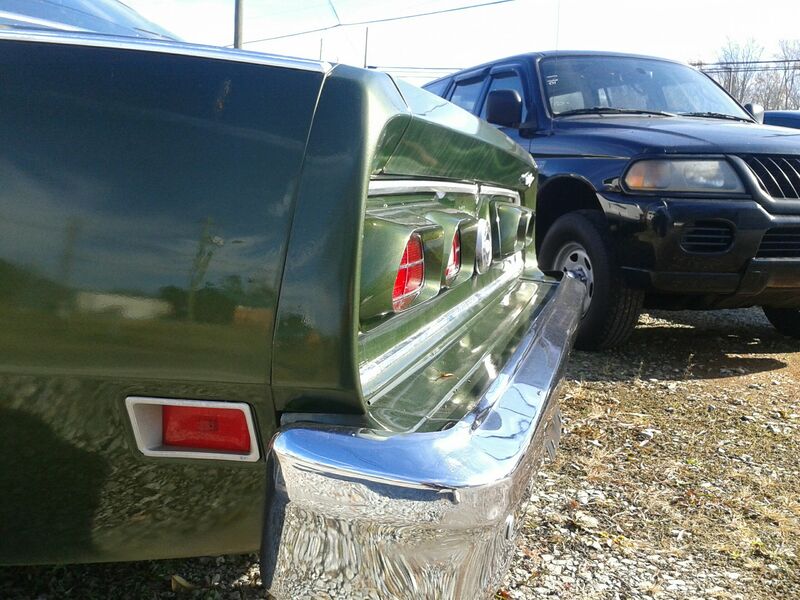 It appears that the Comet used the same, relatively flat bumper as the Maverick, which required that ridiculously large filler panel to cover the additional area on either side of the Comet’s “snout.” And while the fuel economy effects of that additional weight were mentioned, you can only imagine how handling was affected by having all of that mass mounted far above the front axle. 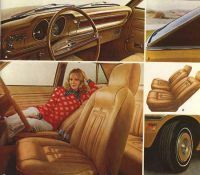 That vinyl seat material seemed to hold up better than the stuff that GM and Chrysler were using in that time period. 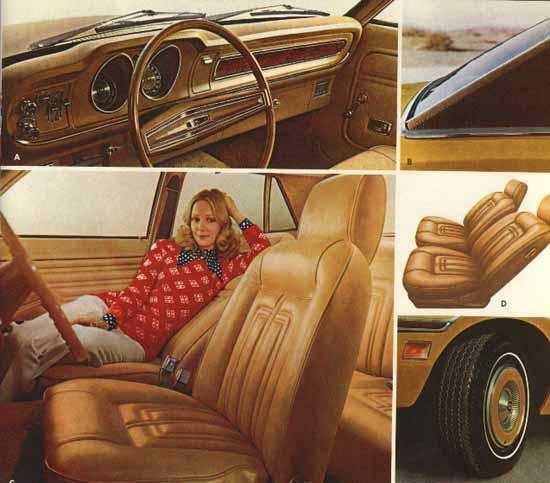 Chrysler’s Insta-Split ™ seats in the Valiants and Dusters of those years were really bad. And yes, all of us over 50 still have the faint patterns of vinyl seats burned into our legs from our youth. Convertibles with black vinyl seats were a really bad combination on sunny days. Don’t forget those wonderfully solid brushed stainless steel seatbelt latches on GM products! They always left the Mark of Excellence on a sunny summer day, if you sat on them in shorts. This one is in terrific shape, given their tendency to rust. A family member had a ’74 Maverick coupe, bought new, that had significant corrosion by ’79-’80. His didn’t have the bumper guards, so the front end wasn’t quite so imposing. I remember the body panels and hood seeming so solid on these, but still highly vulnerable to rust. It was parked the first few winters. By 1981, the bottom of both door skins had to be replaced, along with the rocker panels. I was a boy during the Massive Bumper Era and they seemed normal to me at the time — of course, because I lacked perspective. But you have to admit, the tiny bumpers on the pictured four-door were vestigal at best. They weren’t going to protect anybody from anything. I too was young when the bumper standard came into effect. What I remember is that it was a handy way to instantly judge a car’s age. Cars with skinny or flush bumpers were “old” lol. Bumpers don’t protect anybody from anything anyway, before or after 1974. Insurance companies prefer to collect money rather than pay out so they lobbied for the bumper laws so less components would have to be replaced in a minor impact, thus maximize their profits. The first new car my sister (the one I rescued in another post) ever bought was one of these. It was a brown coupe with a light tan interior, and it had the 250 CID six with automatic. Ironically enough the Comet wasn’t appreciably more frugal with gas than the car it replaced, a ’66 Impala with a 327/’glide combo. For sure it wasn’t as much fun to drive as the outgoing Chevy. She only kept the Comet for two or three years, it was replaced by the first of several Toyotas. I found a 74 for sale last fall. 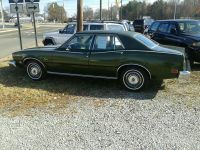 It was a 302 coupe model, the condition wasn’t terrible, I considered it until I walked around front. Let’s just say..’Deal breaker’. I am no Ford expert but the buckels on the seat belts in the front look to “1990s” to be correct for this year. Good catch, I had not noticed that. 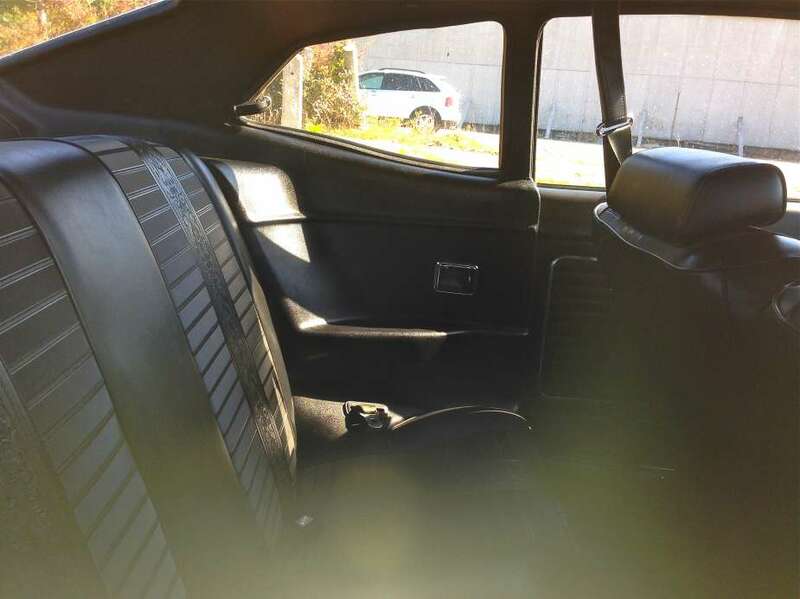 The back seat belts look original, but those buckles are definitely not 70s Ford issue. I wonder if modern Ford buckles still accept the old tongue from the 70s design? Or, the owner may have upgraded for safety. 74 would have been the first year for the one-piece lap/shoulder belt. No experience with 74 Fords to know if it was different from later years. I can’t help but think of the mound of snow that would have built-up on the front of the car in the depths of winter, obscuring the headlights and turn signals if you didn’t take the time to brush it off. Yes that did happen, more frequently on the rear of cars, because cars of the day typically had sloping rear ends, while the fronts were much more vertical (plus the heat of the headlights would melt the snow). My Grandmother bought a 72 Comet sedan brand new. The only options were an AM radio, automatic, and whitewall tires! Miserable car! I one thought about buying a Maverick coupe w/ the LDO option. I couldn’t sit upright in it! 6’5″ tall. May be it was not meant to be a bumper, but a build-in picknick table instead. Nice solution. Or extra seating at a drive in movie? A couple of throw pillows and you’re all comfy! Maybe it’s just the slim bumpers, but I don’t think the 4-door looks THAT bad. 4-door Novas looked way worse to me. My personal favorite for bumper picnics was my Uncle’s Toyota Starlet. All plastic so there was no lip between the bumper and filler panel, and the bodywork sloped away from the table surface leaving more room for salad bowls and good dishes! Cars that debuted ’75 on up handled the new bumpers much better than the older models that got them after the fact. Compared to the Comet a similar age Chevy Monza, VW Rabbit, Capri II or even Ford’s own Granada/Monarch looked pretty decent. The second observation is that some companies tried really hard to improve the bumper appearance before the all new model arrived. For example the ’78 Scirocco looked much nicer than the ’77. BMW famously skinnied up the bumper on the E30 going from aluminum to plastic mid-cycle. 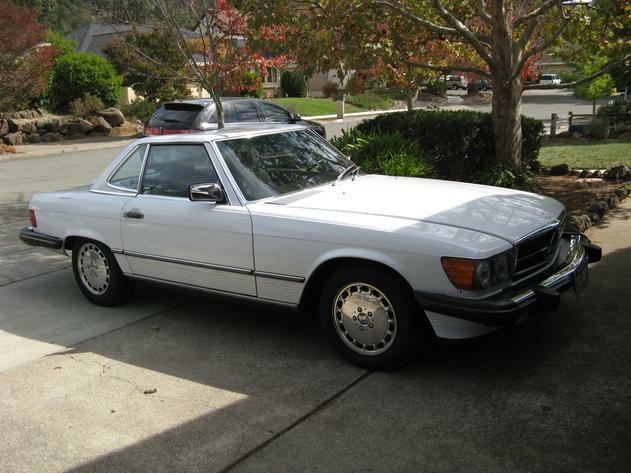 Because of those efforts, and the fact that bumper regs had gotten easier, Mercedes seemed rather strident sticking to their ’74 design all the way to the end on the ’89 560SL. Older buyers are typically less demanding on such things. I still feel the best year for bumpers was ’73, even better than ’72 on the likes of Pantera, Capri and Pinto. In one year Ford went from doing them best to doing them worst. I’ll tell ya, I have gained SO much respect for the diving board bumpers on my ’89 E30…they’ve saved me from thousands of bucks worth of damage from NYC parking over the years…while they look like crap I don’t think I’d ever change ’em. 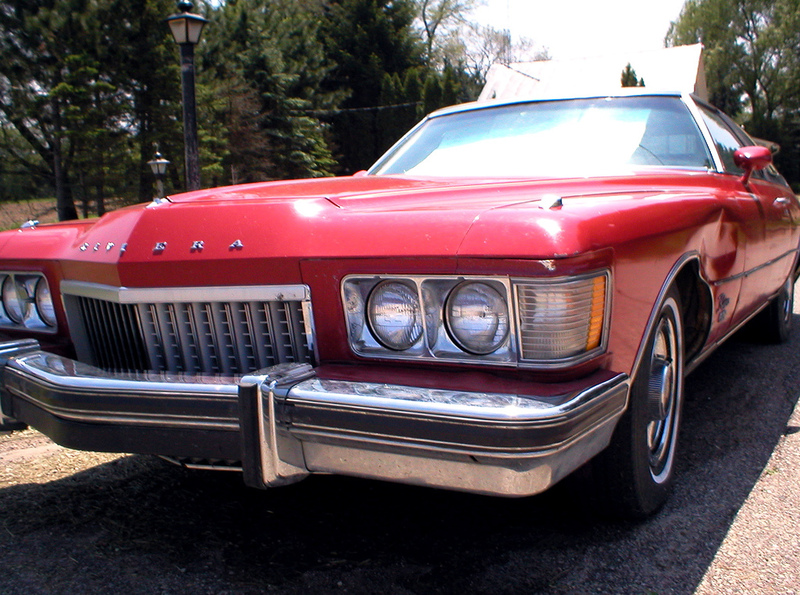 Among American cars, it is hard to find one that handled it better than the 1974-78 Chrysler/Imperial. Chrysler seemed to do a better job of integrating them all up and down the line. I would put GM in the middle. 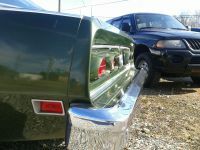 The bumpers on the 1975-79 Chrysler Cordoba and 1975-77 Dodge Charger are nicely integrated, too. Pictures #3 and #4 wow, look at that bumper filler. Seriously, what was Ford/Mercury smoking? That front bumper insert looks like one of those jokes out of a ’70s MAD magazine. I knew seeing this reminded me of something, these Cadillacs are ‘almost’ as bad…almost. That’s what happens when you have the accountants do the designing. Those bumpers look almost as bad as the Canadian Minis from the 70s with the bumper slung in the middle of the grille. The one car that looked good with early 5mph bumpers was the Volvo 140 series, the “battering rams” really suited the blocky shape and indestructible image. My late and very unlamented ’75 164E had rather decently done 5mph bumpers. I had a big bumper 145 that my dad bought in tandem with my grandfather’s big bumper 164 in late 1974. Those bumpers look big enough to post Secret Service agents on. I remember friends who had Maverick ‘Grabbers’. They were so damned proud of their smogged low compression 140 horse 2 barrel carbed 302 that had to push a 3200 pound car through a C4 and high ratio rear end. The hype was so much more imposing than the actual experience. 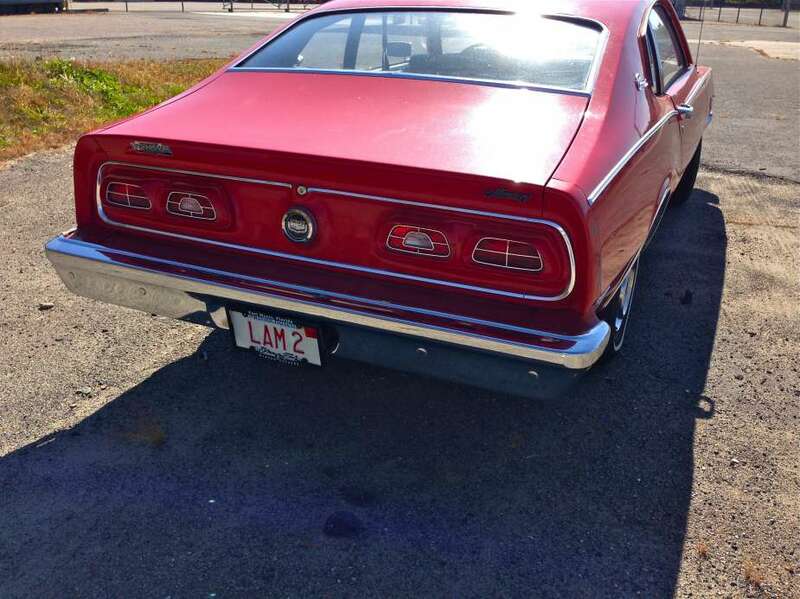 But…my college roommate had a ’76 Torino with a 302 and it was worse, much worse. No wonder the Camaros sold so well during this era. Always liked the looks of the 2 door Maverick. 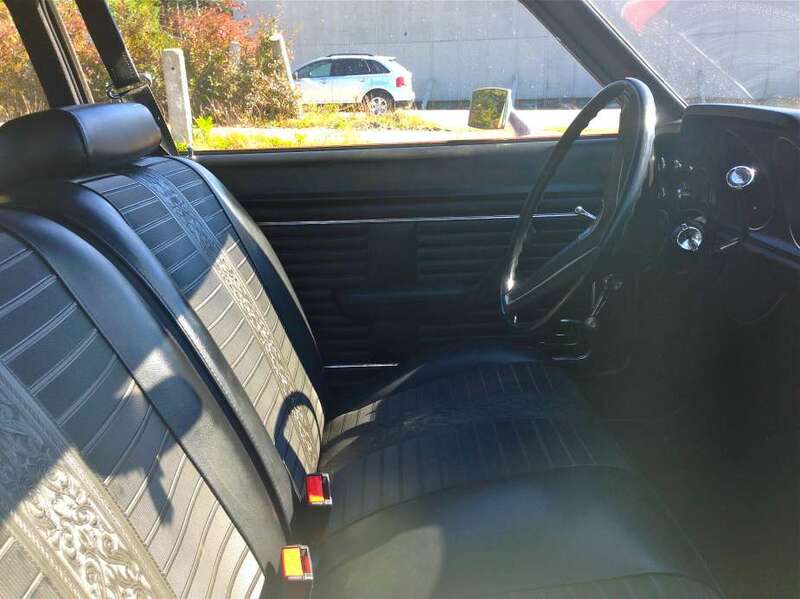 In 73, I considered the broughamated “Luxury Decor Option” with the color matched wheel covers, halo vinyl roof, shag carpet and even an extra coat of paint. Nice car. Didn’t pull the trigger tho, which turned out to be a good thing as Ford had decided to stop drilling oil passages in the crank, leaving the rod bearings dependant on splash. Oil doesn’t splash in a Michigan winter, and Ford ended up with a massive recall for burned up engines. 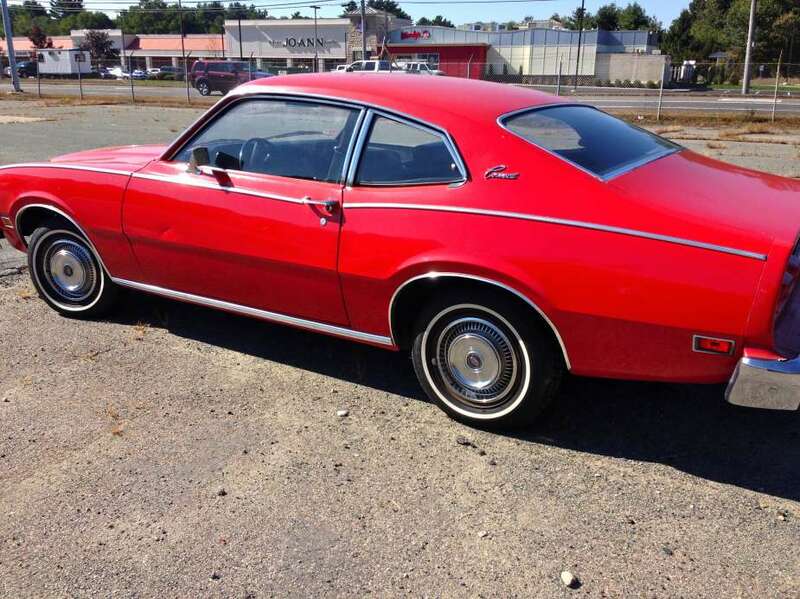 I was but a child of 10 when the ’74s were introduced… and I think Ford’s bumpers scarred me for life. When I was a young’en i thought the Maverick/Comet twins were nice looking cars (still do, although I now prefer the 4 door’s styling) but when they hung those gawdawful chrome-plated bridge beams… yikes. 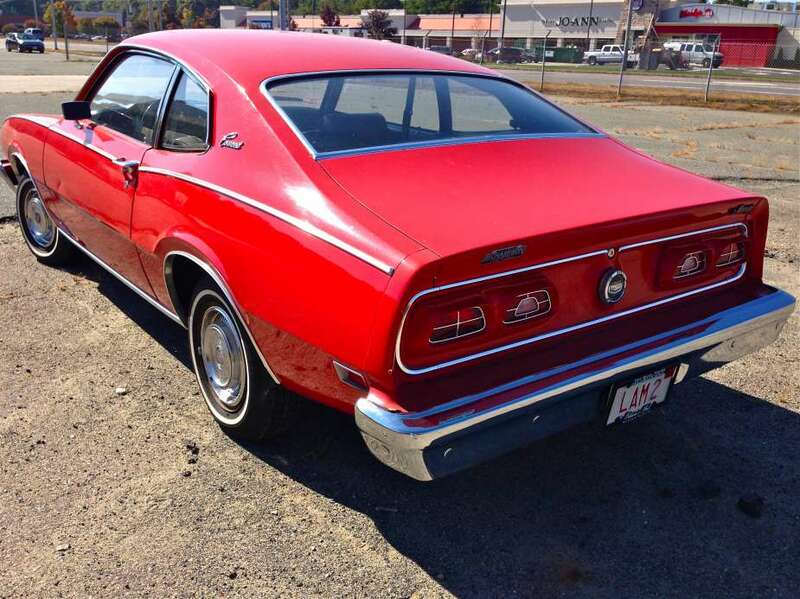 I was four when we moved to the US from the UK in 1975 and my father bought a new Mercury Comet as it was the only car in the local dealerships that had a floor shifter and bucket seats. He soon regretted it as the car was gutless with a 250, my mother couldn’t see out of it, and as an avid home car washer, the vinyl roof held dirt. So within months he had another bite at the Mercury cherry and got a Monarch with a 302 which gave three happy years’ motoring. The comments about being branded with patterned vinyl brought back a lot of memories, as do the bumpers, which I used to stand on to help my father wash the car. Definite contender for worst integration of the 5 mph bumper. Some nominees and a vote on the worst might make an interesting CC. One more. I have no idea what they’re asking for the car. They also happen to have a maroon GTA Trans Am, purple C4 Corvette and bright blue C4 Corvette: a cornucopia of beautiful colors! Great color, what a beauty. Always loved these and it looks really straight too. I hope that it goes to the ‘right’ buyer who truly appreciates the car. Yet another one for the imaginary 20 car garage. Oh Pontiac, how we miss you. Thanks so much for posting the pic. You’re welcome. 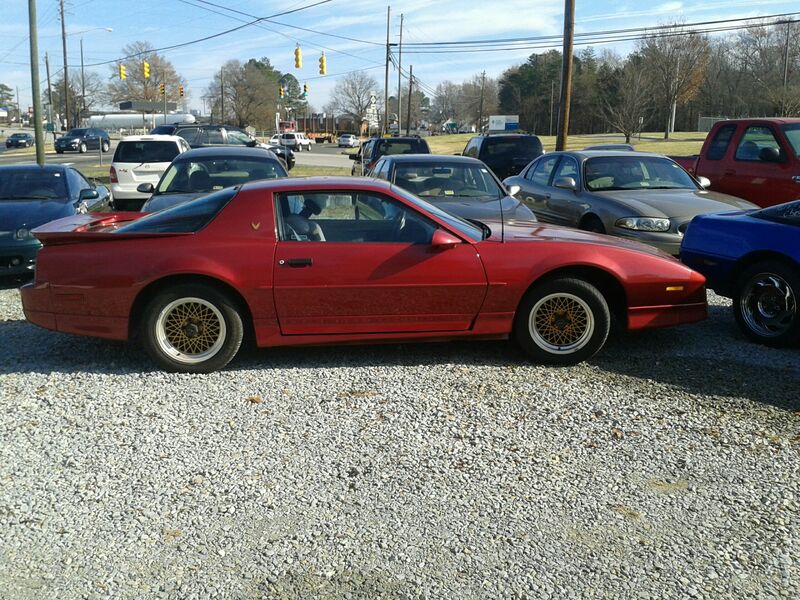 I created a “Random Car Sightings” board on Pinterest & added pics from this car lot in case you are bored (click on my avatar). I have a gutteral dislike bordering on hate for these cars for no apparent reason. I still find them overwhelmingly unattractive. A friend of mine in college had a 2-door Comet that in 1989 had already seen far better days. It had the I-6 and we travelled 350 miles to DC one Fall break in it. The car used so much oil that Doug never had to change the oil. In fact we went through a case just getting to and from DC. Well that is a handy hatchback to have in San Francisco or New York City. I like the bumpers. Sooner or later cars get bumped and these really help. The Reagan bumpers on my 88 Lincoln were so flimsy compared to my mark vi and the bumpers on my 78 ford and Lincoln were better still. Now the cars are just plastic and they can’t take any sort of hit. I say bring back the nice sturdy shock bumpers and it will save your sheet metal. They all get hit sooner or later. The real bumpers and will protect a car. On cars I have owned they have proved stronger than highway signs and barrels and dodge neons and Pontiac bonnevilles. What’s not to like?? The plastic ones can’t take a hit and are not safe. I say bring back the real ram shock bumpers. I like bumpers too, believe me I do. Especially when the designers take the time to integrate them into the ‘look’ of the car. Not only are they functional, but can enhance the styling, instead of detracting from it, like the Comet. I live in an Urban area and I see the result of these modern painted flex body extensions draped over the hidden plastic/styrafoam functional ‘bumper’ mechanism underneath. The result, well… it’s not a good thing. (except for the local body shops $$) Besides the fact that, personally I am over the ‘look’ and wish for a return of some sort of actual bumper. And I could not agree with you more about real bumpers with shock absorbers behind them. But yeah, where cars are concerned, I suppose I will always mostly live in the past and that is my own issue to deal with, although… I like it that way. But… Whaaa, ‘Reagan bumpers’? President Reagan did not design or mandate the bumpers on your 1988 Lincoln, FoMoCo did, blame them. Ford trimmed those bumpers down and made them look more integrated, supposedly ‘sleeker’ to keep up with new styling themes and ‘freshen’ the car. And there is no doubt that they were thinner gauge and less effective and more easily damaged, (as well as cheaper $$ for Ford), especially since they no longer wrapped around the corners of the car. How is that a U.S. Administration’s or Dept of Transportation’s fault? Moreover and as a side-note, I can clearly state that no matter the era, Ford’s bumpers were never up to the standards of GM, including the rub strips. For decades GM used insanely heavy gauge steel, triple plated chrome on all the finer car lines, and real, solid rubber strips. All while Ford used much thinner plated steel, and plastic, hollow bumper strips, all the way back to 40 years ago. And it showed, it is so evident even on Continentals, Town Cars and Mark IV and V era cars. Possibly, you are blaming the Reagan era drop to 2.5mph requirement front and rear passed in 1983, but Google image the Lincolns from 1983 and even 1984 after the new standard was passed. They were all still the heavier gauge steel WITH the wrap-around corner sections on the bumpers like older style cars. What you are unhappy about with your ’88 Lincoln is a direct result of Ford Motor Company and others, and their decision to re-style for the times and cost cut. When the Reagan law was passed or relaxed at that time, all the cars still had heavier wrap-around old school bumpers. It was the decision of the manufacturers to cut back and re-style bumpers. They obviously felt that the wrap-around heavy bumpers were looking dated and they then freshened the look. Uhhh, maybe 83mark just meant “Reagan-era” bumpers. Well, certainly no previous gen Riv in the looks dept, bumper or otherwise, but nothing like the complete lack of styling consideration in the bumper dept. that Ford’s approach resulted in, especially with this Mercury. BTW, thanks Otto, there is a perfect close-up of those great heavy gauge, triple chromed, solid rubber stripped GM era bumpers I just wrote about earlier. Ford did NOT ever make a high quality bumper like this even on their top Lincolns. I think I see part of the visual issues with these bumpers on Ford products. Many of them have strongly projecting centre section ( the so-called Bunkie Beak) which means the whole bumper has to be mounted further forward. The other problem is many of these cars have strongly tucked under body sides which means the ends of the bumpers stick out like jug ears! My family had one. Just an awful car. The 302 V8 had all it’s power robbed by smog equipment, lousy handling, lousy drum brakes. It started rusting out before it was even paid for. Thats not a bumper. Its a veranda. All it needs is an awning over it. 1st place for the worst 5mph bumpers should go to the Mercedes W116 S-Class. As if someone did a DIY conversion in his garage. The US headlights are pretty bad as well.